Photos taken in dim lighting tend to be dark. Thus, cameras are often equipped with a flash. While taking a photo, if the camera senses that the scene is dark, it flashes light on the scene before recording the photo. While most cameras use a Xenon bulb for a flash , Bigshot uses a Light Emitting Diode (LED) . Even though they are not as bright as Xenon bulbs, LEDs are smaller, last longer, require less power and are highly efficient. Almost all of the power that they consume is converted into light and very little is lost in the form of heat. Due to these advantages, LEDs are now widely used in everyday electronic devices such as TVs, computer monitors, traffic signals and streetlights . Recently, LEDs are even being used for home lighting and in automobile headlamps. 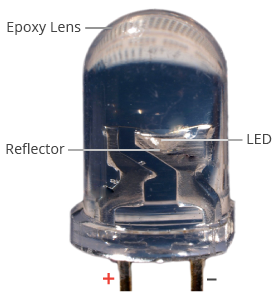 Figure 1 shows an LED embedded inside an epoxy bulb. In what follows, we will describe how an LED works. T. Harris, "How Camera Flash Works," Jul 30, 2002. [Online]. Available: http://electronics.howstuffworks.com/camera-flash.htm. [Accessed: Oct 4, 2009]. "Light Emitting Diode," Oct 2, 2009. [Online]. Available: http://en.wikipedia.org/wiki/Light-emitting_diode. [Accessed: Oct 4, 2009].